In just a couple of years, cloud computing has developed into the basic technology for digitalization. An ever increasing number of companies are using Cloud ERP solutions. The market is growing and so is the level of trust. SAP identified this trend early on, and SAP Business ByDesign is a completely cloud-based ERP solution — not only for SMEs but also for subsidiaries — that has already been on the market for ten years. It is now available in 117 countries and used by 3,700 companies with a total of 100,000 users worldwide. 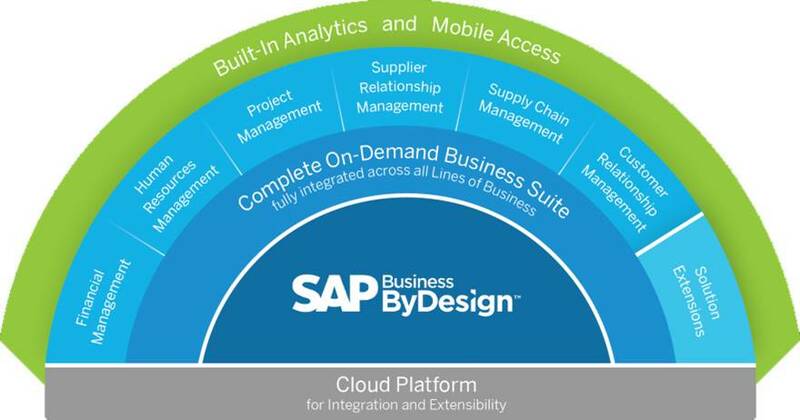 Whether companies want to start a joint venture, open sales offices in other countries or outsource departments or if the IT departments do not have sufficient resources to roll out the SAP Business Suite at the same time, SAP Business ByDesign offers a suitable solution for all these cases. The headquarters use SAP S/4HANA, while the branch offices, local customer service offices, or consulting and engineering companies use the lean cloud approach. There are 70 out-of-the-box integration scenarios, including consolidation of the balance sheet, payroll accounting, master data integration and a procure-to-pay scenario for inter-company business. All legal requirements are reflected. Product- and service-oriented companies will also find 38 immediately deployable integrated and easy-to-understand business processes for purposes such as service and support, sales, marketing, project management, warehouse and logistics, production, finance and procurement. On the one hand, the uniform database allows the parent companies to profit from improved planning and control. At the same time, standardized processes enable better cooperation within the entire company. On the other hand, the subsidiaries also benefit from many advantages: From flexible possibilities for adaptation and operational efficiency on the local level all the way to the high degree of process standardization mentioned above. A further convincing feature of SAP Business ByDesign is its fast and low-cost implementation as it does not require a local IT infrastructure. A complete roll-out can be handled in three to four months. Companies decide to use SAP Business ByDesign for a period of three, five or seven years and can rely on a clear cost structure during this time. They can either pay a subscription fee for each user or book packages. A further advantage is that integrated SAP support for the Cloud ERP is available online or by telephone around the world 24/7. In addition, remote monitoring and integrated help functions provide quick support. And last but not least, SAP Business ByDesign also runs on mobile end devices, so that every employee can access all information anywhere and anytime. Security is the be-all and end-all of cloud computing. This is why the system runs only in state-of-the-art SAP data centers like the one in St. Leon-Rot. It is fully implemented on a HANA cloud platform here and can be scaled for anywhere between 10 and 8,000 users. Companies also benefit from the latest software versions that are updated automatically every quarter. Is your business model about to change? No problem! The highly flexible organizational structure of the Cloud ERP can be redefined quickly as the continuous business processes not only are easy to start up but also grow with your requirements. Ideal conditions for expanding while keeping an eye on the entire company at all times. Read more about how SAP Business ByDesign, the Cloud ERP, help you master the emerging challenges that divestments and M&A bring.